At last! Strawberries are back in the grocery stores! Soon local farmers will have their produce stands on the sides of the road. And on their displays will be succulent, bright red strawberries!! This is a time I look forward to. The fruity aroma, sweet taste and the bright red color of these fruits make me eager to take them home, prepare them, smell, and taste them. Of course I end up eating more than I store for later; well at least the first batch. So I love to tell the Cherokee story of how strawberries came to be created. I have related this story in my own words as best as I can. When Creator made the new world, he placed First Man and First Woman in a beautiful part of the land. There were mountains with wild game for food and timber for fires and building homes. There were rivers with fresh water and fish. Everything they needed was nearby. Just as their world was new and wonderful so was their relationship. They walked hand in hand by the blue streams and along mountain paths, enjoying each other’s company and their new home. They ate from the earth’s bounty; but of all the fruits and root vegetables they found, there were no strawberries. They began to learn the skills of survival together and lived in harmony. Over the following months, they forgot to make time for each other. As many newlyweds eventually do, they became absorbed in their own duties and interests. Saying sweet words of love, showing affection, sharing, or looking with admiration and joy at their beloved mate, were all actions that gradually disappeared and soon ceased. Soon they were too tired to share in the behaviors that made love grow and flourish. One day this deprivation allowed angry words to be said. On returning home from hunting one day, First Man, voiced great displeasure with every little thing his wife did or did not do. Sobbing with hurt and anger, First Woman ran away quickly and continued deep into the forest. A few hours later First Man realized painfully the terrible things he had said and wanted to apologize. Expecting his wife to be outside their home, he was shocked that she was not there and realized how much he missed her. Since it was late in the day First Man also asked Creator for help in slowing his wife’s footsteps so that he might catch up to her before dark. Creator made small green leafy plants with beautiful, white flowers to spread out along her path. Their beauty would hopefully slow First Woman’s pace. She did see the delicate flowers but only briefly admired them. He asked Creator to send some kind of food that First Woman could eat, to lessen her hunger. Also he hoped to slow her footsteps further so he could find her and ease the hurt he had caused. 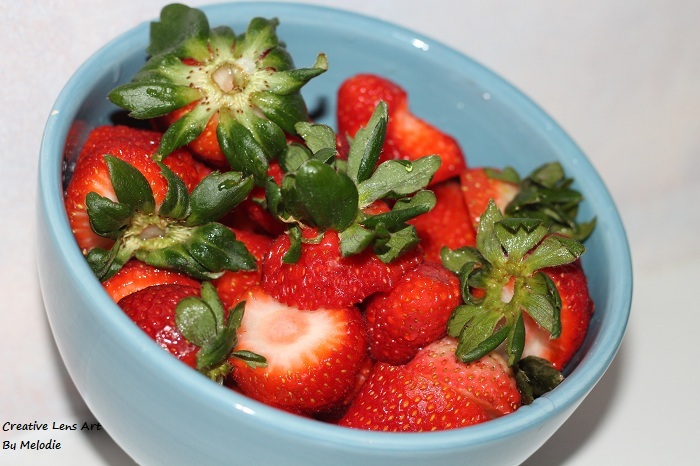 Creator caused the same white flowers to produce fragrant, red, heart-shaped berries: strawberries. Their aroma beckoned to her hunger. First Woman was not able to pass by the sweet smell and taste of the berries. She sat among the green leaves and red berries of the wondrous plant and began to eat the scarlet berries as she gathered them. Suddenly she wanted to share these delectable fruits with her husband. “How hungry my husband must be now.” She did love him and wanted to share these wonderful berries with him. First Woman gathered up as many as she could and started back toward home. At the top of the next hill First Woman met her Husband. She dropped the strawberries to run into his arms. As they held each other tightly, weeping with joy that they had not lost each other, forgiveness was requested and pardon gladly given. Very happy but very hungry, they sat and ate the strawberries. Remembering that they almost lost each other, increased their efforts to care for each other and nurture their love. And they lived in a more loving way from then on. As a reminder of the importance of reconciliation in a loving relationship, Creator made strawberries grow along many more paths and in many more forests. Why Do I Have So Many Clothes! Wow! That is so cool! Now I have an amazing story to share with my favorite strawberry recipe: Strawberry Million Dollar pie. But I buy strawberries every single week b/c they are the fruit staple in our house. Thanks for this! Thank you so much, Liz! I love those Native American Legends. Thank you. I love the way Native Americans explain things and tell stories!! Do they grow in your country? If they do, just go smell of one and you will fall in love with them. I love them! I don’t know though- I am clearly not related to her in any way. There must have been some other more sneaky and selfish women around… Or maybe I take after the first man- I bet he wouldn’t have shared those strawberries… the jerk! 🙂 Yes, they are very fun to read! OK, that explains the strawberries. What is the story behind the necessarily accompanying cream? Well, uh, that wasn’t part of the original legend. There is a theory that whipped cream was first made when someone transporting a churn of cream rode on the back of a fast horse. Lol. I think the whipped cream came much later. Now I know why I love strawberries…..thanks for sharing! Glad that you enjoyed it. I enjoy Native American legends and stories. I love that story, Elaine. What a beautiful legend to remember. I just knew there was a reason that I love strawberries! I am so glad you liked it. Thank you! What a delightful creation legend. Thank you so much for sharing it. Thank you for commenting. Delighted that you enjoyed it.